Ash vs. Evil Dead is an upcoming American horror comedy television series created by Sam Raimi and Bruce Campbell for the Starz network. It is set in the Evil Dead franchise and serves as a sequel to The Evil Dead, Evil Dead II and Army of Darkness. 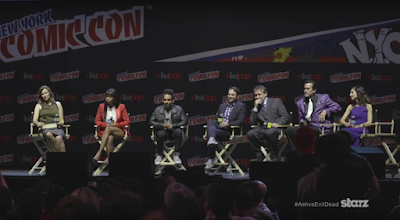 After the screening of Ash vs Evil Dead pilot at New York Comic-Con , Kevin Smith hosted a Q&A with Raimi, Campbell, showrunner Craig DiGregorio, recurring guest star Lucy Lawless, and new cast members Dana Delorenzo, Jill Marie Jones, and Ray Santiago. Like the show, the panel was messy fun. DiGregorio promised future kills involving deli slicers and discussed dreams of visiting new time periods in future seasons of the show. And cast members couldn’t say enough good things about Campbell’s ability to make the ensemble feel welcome in the Evil Dead legacy.